Shaadi.com is a revolution that has touched over 30 million lives and has redefined the way Indian & other singles meet each other, all over the world. With a match being found every 2.4 seconds, we are proud to be the world’s largest platform for matchmaking and matrimony. 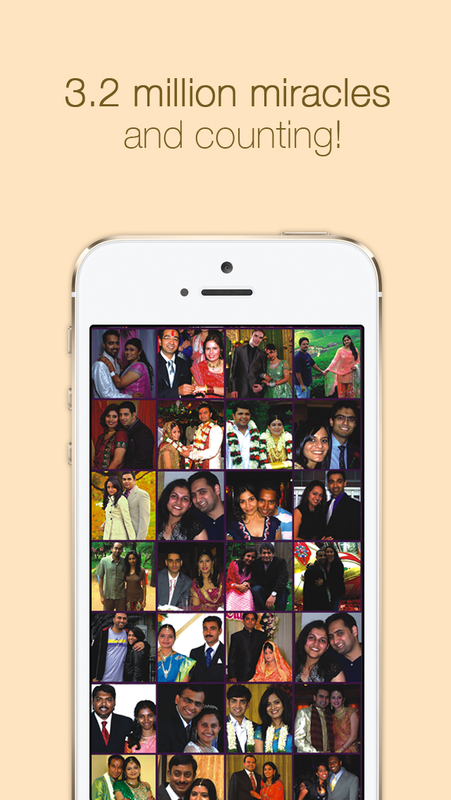 This is also the official app of all our community sites such as hindishaadi, bengalishaadi, gujaratishaadi, kannadashaadi, tamilshaadi, telugushaadi, malayaleeshaadi, marathishaadi, punjabishaadi , odiyashaadi, christianshaadi. Access matrimonial profiles from all Indian communities like Hindi, Bengali, Gujarati, Kannada, Tamil, Telugu, Marathi, Oriya, Punjabi, Sindhi, Malayalam, Hindu, Christian, Muslim, Agarwal, Arora, Baniya, Brahmin, Gupta, Iyengar, Iyer, Kayastha, Khatri, Mudaliar, Nadar, Nair, Reddy, Shia, Sunni and more, on your mobile! Shaadi.com, one of India’s best known brands (also sometimes misspelt as Shadi.com) and the world’s largest matrimonial service was founded with a simple objective – to help people find happiness. The company pioneered online matrimonials in 1996 and continues to lead the exciting matrimony category after more than a decade. By redefining the way Indian brides and grooms across the world (in India, US, UK, Canada & many more countries) meet for marriage, Shaadi.com has created a world-renowned service that has helped 3.2 million people meet their life partners. More and more people are using our services to find their life partner. We at Shaadi.com, are extremely proud of the numerous marriages where we have played a small role in helping our members find their soul-mate. Shaadi.com is the largest platform worldwide, for users who are looking for serious relationships and not casual dating. Download now, register and get started! Now Connect with your Matches via search results. © 1996 People Interactive (I) Pvt. Ltd. All Rights Reserved.